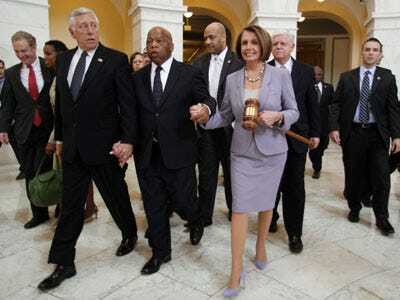 Speaker of the House Nancy Pelosi dropped her giant health care gavel last night. But now that the bill has passed, what’s next?A lot of politicking and, just as likely, a lot of lawsuit filing. Attorneys general from Virginia, Florida and South Carolina already plan to challenge whatever law goes into effect “on the grounds that it violates the Constitution by requiring individuals to purchase insurance,” The New York Times reported. Further, some states have already passed laws that say no state resident may be compelled to buy insurance, so federalism-based challenges will come as well. None of these fights will be over soon. Ken Cuccinelli, Virginia’s AG, told the NYT that winning the Constitutional challenge is not an immediate concern, as the individual insurance mandate will not take effect until 2013. The threat of lawsuits, both based on the bill itself and litigation resulting from the new brand of healthcare, were a constant part of the debate over whether such reform should go forward, but as we’ve noted, the fear of litigation is usually not enough of a reason not to pass new laws. But it will pit those who are very pro-tort reform against their own ideals, as the way to challenge this now is with your vote and by having your day in court.